of Henry by Hans Holbein. Whitehall portrait. Now in the Walker Art Gallery, Liverpool. Mural Portrait of Tudor Dynasty (1537) Palace of Whitehall, London. (bottom row) Henry VIII and Queen Jane Seymour. Considered to be one of the greatest paintings in English history. NOTE: At present, the only known portrait painting of Henry VIII by Hans Holbein the Younger is the panel in the Thyssen-Bornemisza Museum, Madrid. All others are copies 'after Holbein' or by his workshop. This includes the so-called Barberini portrait - the painting of Henry in the Galleria Nazionale d'Arte Antica, Rome. However, the debate on whether or not this portrait is an original Holbein is by no means over. Hans Holbein was one of the four great masters of the German Renaissance - the others being Albrecht Durer of Nuremburg, Lucas Cranach the Elder of Wittenburg and Matthias Grunewald of Mainz. In addition, he was undoubtedly one of the best portrait artists active in Northern Renaissance art of the early 16th century. Indeed he was equalled only by the 15th century Flemish painters Jan van Eyck (1390-1441) and Petrus Christus (1410-75). The reason why Holbein is so important today, is because his celebrity portraits - of Henry VIII, Thomas More, Thomas Cromwell, Erasmus and others - have become the defining portrayals of the individuals concerned. When we think of Henry, for example, it is Holbein's Henry that we recall. Active mostly in London, he became official painter to Henry VIII (reigned 1509-47) in 1536 and is known to have painted several portraits of the king, though only one survives. It was a turbulent and highly political time. Sir Thomas More (1478-1535) had just been beheaded, the Dissolution of the Monasteries (1536-41) had just begun, and Henry's feud with Rome was at its height. Certain clergy and noblemen, as well as Henry's 'queens', could become 'non-people' overnight. Thus, for example, although Holbein painted several portraits of Anne Boleyn, none are known to have survived her execution for treason and adultery. Holbein also worked for Henry's eminence grise Thomas Cromwell (1485-1540) who employed him to create a range of Protestant Reformation art - including a quantity of illustration for an English Bible and a variety of woodcuts on anti-clerical themes. In the last few years of his life he turned to miniature painting, becoming one of Europe's best miniaturists with portraits like those of Anne of Cleves (1539, Victoria and Albert Museum, London) and Henry Brandon (1541, Royal Collection, Windsor Castle), son of Henry VIII's friend Charles Brandon, 1st Duke of Suffolk. The only Holbein portrait of Henry VIII to have survived is the half-length panel painting, dated 1536, which now hangs in the Thyssen-Bornemisza Museum, Madrid. Possibly a preparatory study for a larger work, it is painted in Holbein's typical style, combining elements of the Italian Renaissance and German Gothic art, to produce a balanced portrayal of individual features (flat face, small mouth, watching eyes) and idealized appearance. Due to his strenuous workload as painter to the king, Holbein created most of his portraits in his studio. His first step was typically to make a drawing of his subject, usually at a single sitting. After this he would retire to his studio and work up the portrait from this and other drawings. 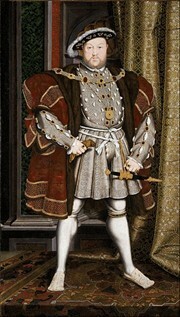 As a result, his Portrait of Henry VIII displays a marked linear style. His Renaissance colour palette, with its greys and golds, perfectly captures his majesty. The elaborate and intricate detail of his tunic and cap are in complete harmony with Northern Renaissance traditions. The principal Holbein portrait of King Henry VIII was done in 1537 as part of a dynastic mural painting, which decorated the privy chamber of the royal Palace of Whitehall. 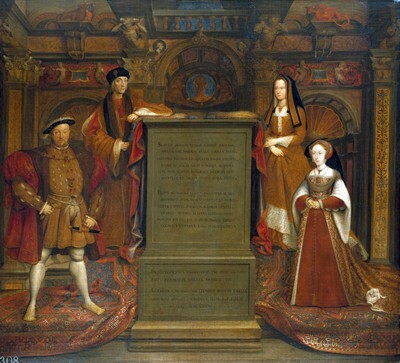 Portraying the Tudor dynasty, the mural featured King Henry VIII with his third wife, Queen Jane Seymour, as well as the King's parents, Henry VII and Elizabeth of York, all arranged around a marble block. It was probably commissioned to celebrate the birth of Henry's long-awaited heir, Edward, who was born in October 1537. 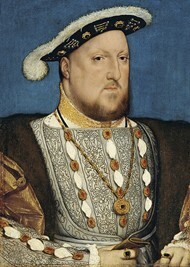 In any event, this portrait became the definitive representation of Henry VIII, and the one from which almost all other portraits have derived. Sadly the Whitehall Portrait itself perished in the fire which destroyed most of the Palace in 1698. Luckily, thirty years prior to the fire, Charles II had arranged for a copy to be made by the Flemish portraitist Remigius van Leemput (1607-75), and this copy is now part of the Royal Collection on display at Hampton Court Palace. In the mural, Henry stands without any of the usual symbols of royal authority, like crown or sceptre, although this was by no means uncommon in progressive portraiture of the period - see in particular, the Venetian portrait painting by Titian of the Habsburg family and others. Even so, Holbein's accomplishment is exceptional. Henry's regal authority is conveyed solely by his commanding stance - legs apart with hands (more or less) on hips - directly facing the viewer. His imposing majesty is further enhanced by his ornate clothes - featuring heavily padded shoulders and a large codpiece - and jewellery, which Holbein picked out in gold leaf. A large fragment of the full-size cartoon for the mural, featuring both Henry VII and Henry VIII, survives in London's National Portrait Gallery, but this depicts Henry in a three-quarters view rather than the head-on stance of the mural. The portrait is a masterpiece of propaganda. There is no sign of Henry's short legs or deteriorating health (he was 46 years old and suffering from a serious accident, and would be dead within 10 years). The king no doubt appreciated the value of the image that Holbein had created, since he made it known that it had his imprimatur, and distributed copies of it throughout the country. In addition, Nobles would have their own copies made in order to demonstrate their loyalty to the Crown. Today, nearly all the surviving copies of the painting are based on the reproduction of the Whitehall mural by Remigius van Leemput, of which the best known copy is the one in the Walker Art Gallery, Liverpool. In addition to his paintings of Henry VIII, Holbein painted the Portrait of Edward, Prince of Wales (1538, National Gallery of Art, Washington DC), as well as numerous portrayals of Henry's wives. Those that have survived, include: Portrait of Jane Seymour (1537, Kunsthistorisches Museum, Vienna); and Portrait of Anne of Cleves (1539, Louvre, Paris). In addition, he painted the prospective spouse Christina of Denmark (1538, National Gallery, London). Although Holbein had artfully survived the disgrace and execution of his first two patrons - Sir Thomas More and Queen Anne Boleyn - the sudden fall of his final patron Thomas Cromwell, in 1540, undoubtedly damaged his artistic practice. Ironically, it was his flattering portrait of Anne of Cleves which contributed in no small measure to Cromwell's disgrace for saddling the king with an ugly wife. Holbein died from the plague at the age of 45. Henry VIII died four years later.  For more outstanding portraits by Northern Renaissance painters, see: Homepage.